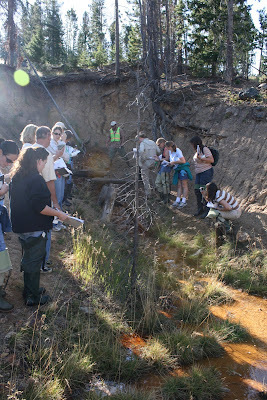 Photo Above: Teachers investigate acid drainage at the former Calliope Mine site. The orange-red color of the water at the site is due to a high iron content. When exposed to water, the mine waste at the site renders the water acidic due to a high sulfur content. The acidic water then dissolves metals present in wastes. The Southwest Montana Science Partnership (SMSP) project partners are pleased to announce the addition of Dr. John Graves to our leadership team. 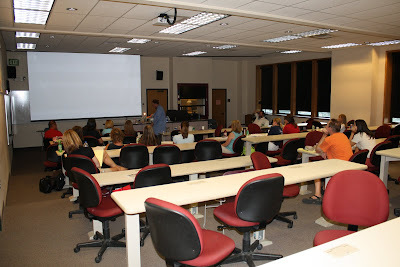 Dr. Graves currently leads the Montana State University Science Education Masters’ Program, and Dr. Graves has over thirty years of middle school teaching experience. He brings a strong focus on inquiry pedagogy skills as well as a keen ability to help teachers and faculty connect online through meaningful and engaging discussions. Photo Above: SMSP teachers look on while Dr. David Hobbs from Montana Tech demonstrates the conductive properties of water. The first cohort of teachers, who started SMSP courses in January 2009, is rolling right along. Teachers completed a water workshop in September and learned about the unique properties of water and how to monitor local streams. 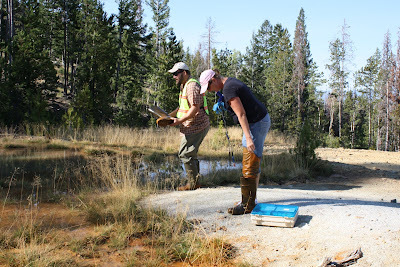 At the workshop, teachers explored two sites for field study, one highly impacted by mine waste water and the other impacted by a sewage treatment facility. The teachers discovered that watersheds can be impacted in many different ways and were quite excited to start exploring water near their area schools. Teachers were given World Water Monitoring kits to use with their students back at their schools, which was greatly appreciated, as school budgets are frequently too tight to afford testing equipment. Photo Above: Science is not without its hazards. A misstep caused one SMSP teacher to slip in swampy mine waste up above her knee. No need to worry- a one-time exposure such as this is unlikely to cause any ill effects. Mining contamination is generally only harmful to human health after long-term, chronic exposure. The teachers and their students will upload their site monitoring data into the World Water Monitoring database to be shared with teachers and students around the world. The second cohort of thirty teachers will begin their study in January 2010 with the field mapping module. In addition, principals from our partner schools will be invited to attend the Principal’s/Leadership workshop in February. The addition of thirty teachers in cohort II and all participating principals will bring the total number of SMSP participants to over seventy. The project partners will be very busy indeed! The SMSP project is funded by a ESEA, Title II Part B Mathematics and Science Partnership Grant through the Montana Office of Public Instruction.